On our trip to Chicago, my wife and I visited Hull House, one of the first Settlement Houses in the United States and home to Jane Addams. It is now a museum located in the middle of the University of Illinois, but 130 years ago it stood in the middle of the worst immigrant slums in Chicago. Addams was born into privilege, yet in 1889 she and her friend, Ellen Gates Starr, decided to moved into a house in the heart of the immigrant slums of Chicago. Their initial idea was to providing daycare for children living in poverty. In the process they came face to face with the great hardships and disadvantages or poor immigrants all around them. The focus or their mission kept growing to meet the endless needs. Daycare was supplemented with preschool and educational services. They opened the first playground in Chicago. She saw that child labor practices prevented theses children from having a full childhood, so she advocated for laws against child labor. Her mission grew to serve the parents and others adults. Addams recognized that there were community and systemic issues that prevented the poor from improving their lives, things beyond their control. For example, the stench of garbage filled the streets and created unsanitary conditions. People were getting sick because the city wouldn’t regularly pick up the garbage in their neighborhood. She fought the city and won regular trash pick-up. When she learned that there were only 5 bathtubs in the whole community, she built a pubic bath beside the Hull House where hundreds of people came every week. Intervening to help the poor and to lift their burdens on multiple social levels became her pattern. She took in homeless families, listened to their stories, helped them find housing and then advocated for better housing. She sheltered woman who were abuse by their spouse, listened to their stories, helped them get on their feet and used what she was learning to advocate for social change. 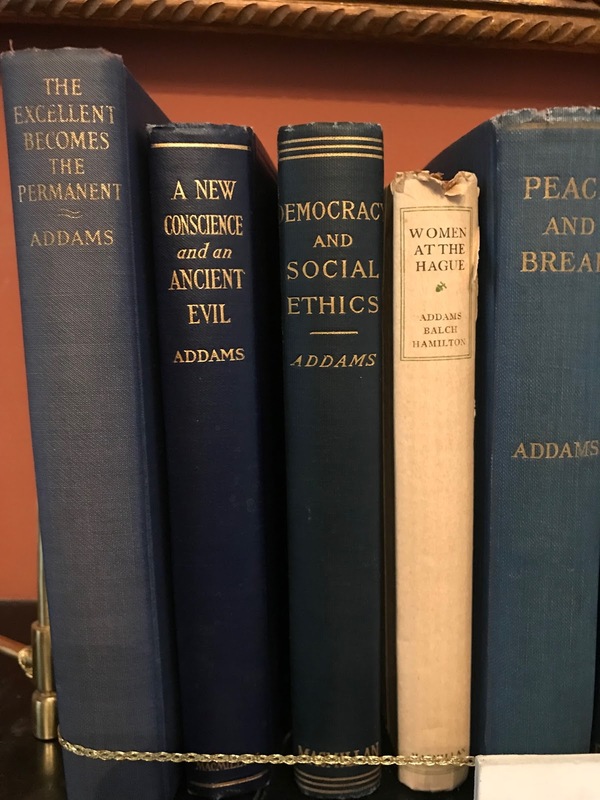 Moreover, the work of Addams and Starr at Hull House attracted some of the best and brightest woman of the day to study the conditions of the poor and and disenfranchised, and to organize social movements for social change. Addams became a prolific writer and prominent national spokesperson for social change in the 1930’s and 1940’s. The data she and other collected on the social issues of the poor, and social research at Hull House, helped inform her writings. Her advocacy and social ideas got her labeled as the most dangerous woman in America by none other than the Daughters of the American Revolution. Herbert Hoover’s FBI compiled lengthy files on her anti-war activities during WW I. Still she persisted. This intervention methodology is the foundation for the profession of Social Work. This is the mission of social work and what sets it apart from psychology and other helping professions. In 1931 Jane Addams became the first American woman to win the Nobel Peace Prize for her work at Hull House.